September 19th, 2018, Singapore – The technology company that's leveraging Blockchain to build applications and businesses with transparency and control of data in its core, begins ICO. DBX made headlines this week with the announcement of their ICO launch that is expected to shake up the Blockchain ecosystem. The ICO, which is now open, intends to help DBX expand its operations and help businesses utilise blockchain in a workable and "real life" manner. DBX, or Database X, has been described as a fundamental breakthrough in the rollout or usage of blockchain for more businesses. DBXChain's data ecosystem, built on blockchain, is designed for the big data era. The primary mission is to build a highly efficient and safe blockchain network, which encourages strengthened data exchange, and data value mining. The main hindrances of data exchange currently are data wastage, data islands, data scattering, and supply versus demand imbalance. To solve these problems, DBXChain offers a demand oriented, structured community network to serve as a safe, efficient, traceable, connected and deeply useable data trading platform, suitable for data exchange and decentralization. While blockchain to date has been revolutionary, it is limited in terms of real world applications. This is where DBXChain is unique, as it is designed for real world purposes. 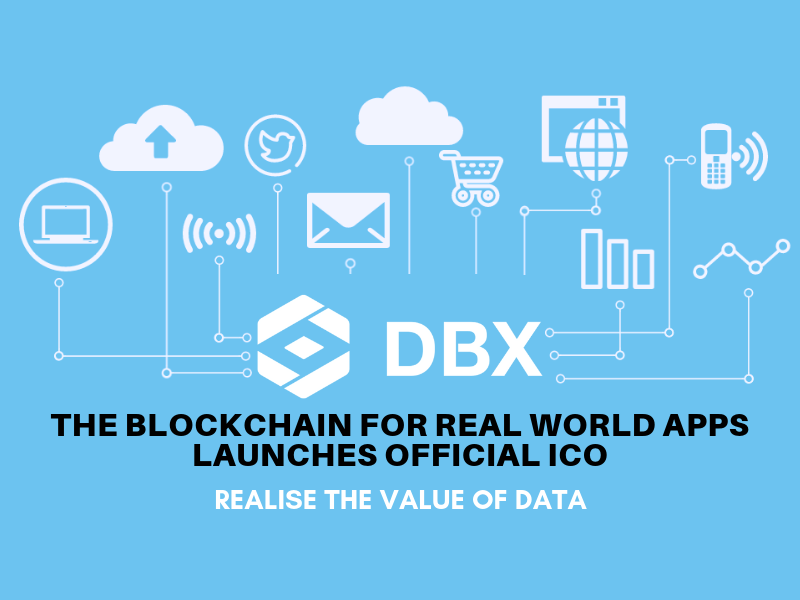 DBX (Database X) is a value-based ecosystem of data built on blockchain. It is a decentralized community for exploring and exchanging valuable data. It utilises a huge amount of "useless" data to achieve great value by making a correlation with demand which was previously undiscovered. This enables every participant in the community to acquire data with higher efficiency, lower cost and fairer trading. All data is, of course, accessed with the users consent. DBX put a huge emphasis on safe data and data protection. Users even have an option of monetising their own data, with a unique revenue sharing model. DBX launched in 2016 and have since developed their own blockchain which aims to improve the now outmoded blockchain. DBXChain's main business is data infrastructure that releases data's value and "atomizes" data transactions. Data connections, that were not previously able to release value, have been made possible by this new blockchain operation system. As a result, this opens up blockchain to far more "real world" relevance than has previously been possible. At the end of 2016, Tomi Wen, the founder of DBXChain, chose to get into the blockchain market by working on the underlying system of public chain and data infrastructure in the blockchain world. Tomi Wen holds a bachelor's degree from Renmin University, and is a tech geek. He developed a software DIY-Page at age 15 and became "the software author that made Baidu change its algorithm".